Deck and patio lights are not only elegant, but provide needed safety. Deck lighting is one of the easiest and fastest ways to enhance a deck or patio area. 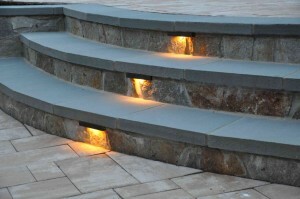 It is so versatile that it can also be installed in stepping stones and pavers to light the pathway or even on post. As with most landscape lighting, deck lighting also increases security and safety around the patio and deck area, making the outdoor space usable around the clock. A few outdoor lighting upgrades in your backyard will transform your landscape to play host to some of the coziest and intimate time with family and friends, all year long. Rope lights add a completely different aspect to the world of deck lighting. Rope lights allow your imagination to run wild by outlining features like deck railings, stairs, post, and planters. This specialty lighting consists of a string of low intensity LED lights all fitted into a clear PVC tube. The perfect application runs a line of lights on the underside of a railing and following the steps to make for some unusual visual effects. No matter if it is a deck or patio almost everyone could use some additional lighting. There are plenty of outdoor lighting fixtures on the market to fit every situation. Adding outdoor lighting is a great safety measure for you and your family. There are a few ways to light the deck properly depending on the style and material of your deck. The easiest and many times the most effective deck lighting is installing lighting into wooden deck posts. This type of installation allows for a clean look and broadcasts light close to 8 feet wide. The higher the fixture is placed, the softer and gentler the effect created, allowing for a more realistic and natural look. If your deck has posts on both sides of the steps, alternate the location from one side to the other as you go down. This will allow the light to overlap and look more natural. Any time you have an elevation change, outdoor lighting should be present to deal with safety concerns. Deck lights and rope lights can also be used in benches and seat walls. This entry was posted on Friday, July 28th, 2017	at 11:07 am	. You can follow any responses to this entry through the RSS 2.0	feed. Both comments and pings are currently closed.